from [Cosmos?] 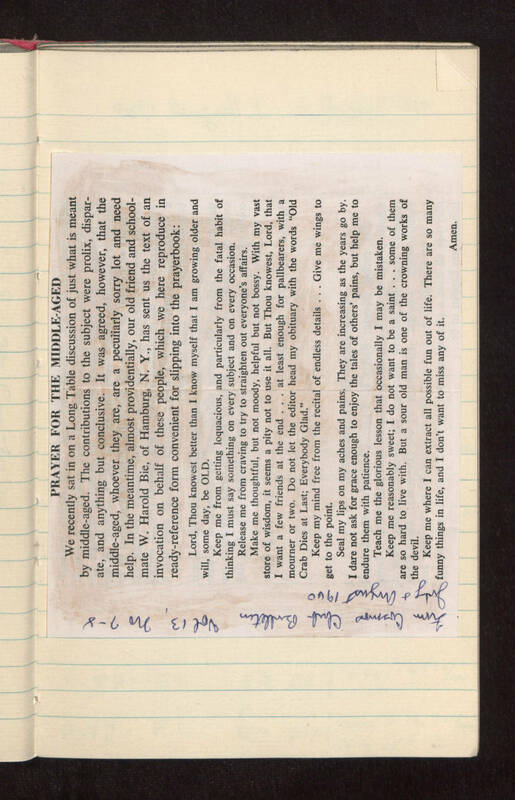 Club Bulletin, Volume 13, Number 7-8, July and August 1960: [printed insert:] "Prayer for the Middle-Aged We recently sat in on a Long Table discussion of just what is meant by middle-aged. The contributions to the subject were prolix, disparate, and anything but conclusive. It was agreed, however, that the middle-aged, whoever they are, are a peculiarly sorry lot and need help. In the meantime, almost providentially, our old friend and schoolmate W. Harold Bie, of Hamburg, N. Y., has sent us the text of an invocation on behalf of these people, which we here reproduce in ready-reference form convenient for slipping into the prayerbook: Lord, Thou knowest better than I know myself that I am growing older and will, some day, be OLD. Keep me from getting loquacious, and particularly from the fatal habit of thinking I must say something on every subject and on every occasion. Release me from craving to try to straighten out everyone's affairs. Make me thoughtful, but not moody, helpful but not bossy. With my vast store of wisdom, it seems a pity not to use it all. But Thou knowest, Lord, that I want a few friends at the end . . . at least enough for pallbearers, with a mourner or two. Do not let the editor head my obituary with the words "Old Crab Dies at Last; Everybody Glad." Keep my mind free from the recital of endless details . . . Give me wings to get to the point. Seal my lips on my aches and pains. They are increasing as the years go by. I dare not ask for grace enough to enjoy the tales of others' pains, but help me to endure them with patience. Teach me the glorious lesson that occasionally I may be mistaken. Keep me reasonably sweet; I do not want to be a saint . . . some of them are so hard to live with. But a sour old man is one of the crowning works of the devil. Keep me where I can extract all possible fun out of life. There are so many funny things in life, and I don't want to miss any of it. Amen."